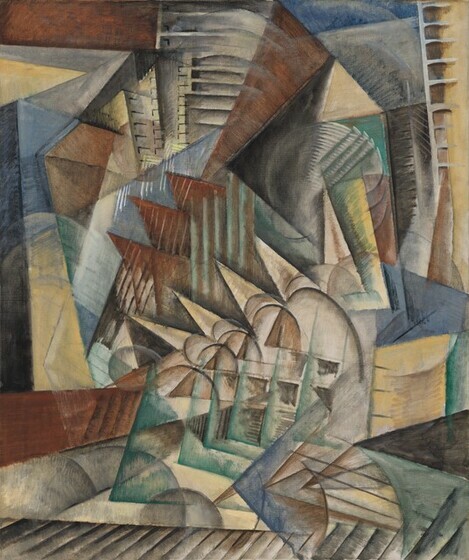 Robert Torchia, “Max Weber/Rush Hour, New York/1915,” American Paintings, 1900–1945, NGA Online Editions, https://purl.org/nga/collection/artobject/52086 (accessed April 19, 2019). Rush Hour, New York is arguably the most important of Max Weber’s early modernist works that capture early 20th-century New York City's ultramodern urban spirit. The painting achieves a remarkably vivid sense of the city's frenetic pace through the artist’s adaptation of both the shallow, fragmented spaces of cubism and the rapid-fire, repeating forms of Italian futurism. Weber was inspired by New York’s elevated railways and underground subways—mass transit systems that were among the most visible manifestations of the new urban age. These conveyances made it possible for hundreds of thousands of people to travel to and from work every morning and evening. Weber represented rush hour as what Alfred Barr, the scholar and first director of the Museum of Modern Art, called “a kinetograph of the flickering shutters of speed through subways and under skyscrapers.” Here the mundane annoyances and frustrations of commuting give way to the vast abstractions of space and time. The other paintings are New York at Night (The Archer M. Huntington Art Gallery, The University of Texas at Austin), New York Department Store (Detroit Institute of Arts), and Chinese Restaurant (Whitney Museum of American Art, NY). New York’s new mass transit systems, the elevated railways (or “els”) and subways, were among the most visible products of the new urban age. Such a subject was ideally suited to the new visual languages of modernism that Weber learned about during his earlier encounters with Pablo Picasso (Spanish, 1881 - 1973) and the circle of artists who gathered around Gertrude Stein in Paris in the first decade of the 20th century. Irving Lewis Allen, The City in Slang: New York Life and Popular Speech (New York, 1995), 91. One of the expression’s earliest appearances was in the caption to an illustration by T. de Thulstrup in Harper’s Weekly on February 8, 1890 [fig. 3] [fig. 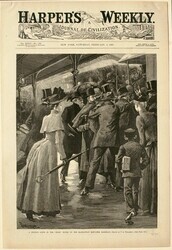 3] T. de Thulstrup, "A Station Scene in the 'Rush' House of the Manhattan Elevated Railroad," from Harper's Weekly 34, no. 1729 (February 8, 1890), Sterling and Francine Clark Art Institute, Williamstown, Massachusetts: “A Station Scene in the ‘Rush’ Hour of the Manhattan Elevated Railroad.” The els became an integral part of New York’s cityscape and appear in many paintings of the period, such as John Sloan’s The City from Greenwich Village. Dominic Ricciotti, "City Railways/Modernist Visions," in Susan Danly and Leo Marx, The Railroad in American Art: Representations of Technological Change (Cambridge, MA, 1988), 132. Dominic Ricciotti, "City Railways/Modernist Visions," in Susan Danly and Leo Marx, The Railroad in American Art: Representations of Technological Change (Cambridge, MA, 1988), 132; quoted in Percy North, Max Weber: The Cubist Decade, 1910–1920 (Atlanta, GA, 1991), 37. Irving Lewis Allen, The City in Slang: New York Life and Popular Speech (New York, 1995), 90. 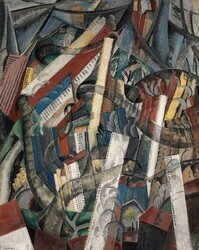 The artist [1881-1961]; his estate; purchased 1970 through (Bernard Danenberg Galleries, Inc., New York) by NGA. Max Weber Retrospective, Museum of Modern Art, New York, 1930, no. 33. Max Weber, Paul Rosenberg Gallery, New York, 1945. Max Weber: Retrospective Exhibition, Whitney Museum of American Art, New York; Walker Art Center, Minneapolis, 1949, no. 18, repro. Abstract Painting and Sculpture in America, Museum of Modern Art, New York, 1951, no. 108, repro. Max Weber: Retrospective Exhibition, The Newark Museum, 1959, no. 20. Roots of Abstract Art in America, 1910-1930, National Collection of Fine Arts (now National Museum of American Art), Washington, D.C., 1965-1966, no. 187. Six decades of American Art, The Leicester Galleries, London, 1965, no. 91. The Cubist Epoch, Los Angeles County Museum of Art; The Metropolitan Museum of Art, New York, 1970-1971, no. 320, pl. 197. City and Machine Between the Wars: 1914-1945, Museum of Fine Arts, St. Petersburg, Florida; Loch Haven Art Center, Orlando; Cummer Gallery of Art, Jacksonville, 1973-1974, no. 15. The Golden Door: Artist-Immigrants of America, 1876-1976, Hirshhorn Museum and Sculpture Garden, Washington, D.C., 1976, no. 3, repro. Paris - New York, Musée National d'Art Moderne, Paris, 1977, unnumbered catalogue. La Pintura de Los Estados Unidos de Museos de la Ciudad de Washington, Museo del Palacio de Bellas Artes, Mexico City, 1980-1981, no. 41, color repro. Visions of New York City: American Paintings, Drawings and Prints of the 20th Century, Tokyo Metropolitan Museum, 1981, no. 88, repro. American Masters of the Twentieth Century, Oklahoma Art Center, Oklahoma City; Terra Museum of American Art, Evanston, Illinois, 1982, no. 53, repro. (shown only in Oklahoma City). Max Weber: American Modern, Jewish Museum, New York; Norton Gallery and School of Art, West Palm Beach; McNay Art Institute, San Antonio; Joslyn Art Museum, Omaha, 1982-1983, no. 44, repro. (shown only in West Palm Beach and Omaha in 1983). Futurismo e Futurismi, Palazzo Grassi, Venice, 1986, unnumbered catalogue, repro. Max Weber: The Cubist Decade, 1910-1920, High Museum of Art, Atlanta; Museum of Fine Arts, Houston; Corcoran Gallery of Art, Washington, D.C.; Albright-Knox Gallery, Buffalo; Brooklyn Museum, 1991-1993, no. 57, repro. To Be Modern: American Encounters with Cezanne and Company, Museum of American Art of the Pennsylvania Academy of the Fine Arts, Philadelphia, 1996, unnumbered catalogue. Max Weber's Modern Vision: Selections from the National Gallery of Art and Related Collections, National Gallery of Art, Washington, D.C., 2000, brochure. Tempus Fugit: Time Flies, The Nelson-Atkins Museum of Art, Kansas City, 2000, fig. I.31. Debating American Modernism: Stieglitz, Duchamp, and the New York Avant-Garde, Georgia O'Keeffe Museum, Santa Fe; Des Moines Art Center; Terra Museum of American Art, Chicago, 2003, no. 15, repro. Art in America: 300 Years of Innovation, National Art Museum of China, Beijing; Shanghai Museum; The State Pushkin Museum of Fine Arts, Moscow; Museo Guggenheim Bilbao, 2007-2008, unnumbered catalogue, repro. The pre-primed, finely woven linen support remains unlined and mounted on its original stretcher. The smooth, white priming remains exposed in many areas, and thus functions as an integral part of the design. The artist applied oil paint rather thinly, and extensive charcoal underdrawing is visible through much of the translucent paint film. The painting is in very good condition. The surface is coated with a moderately thick layer of natural resin varnish that has discolored. Cahill, Holger. Max Weber. New York, 1930: 26-27, pl. 9. Baur, John I.H. Revolution and Tradition in Modern American Art. Cambridge, Massachusetts, 1951: 52. Rosenblum, Robert. 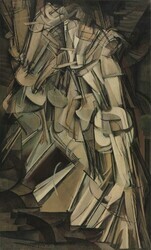 Cubism and Twentieth-Century Art. New York, 1960: 221-222, 322, fig. 151. Rose, Barbara. American Art Since 1900: A Critical History. New York and Washington, 1967: 88, fig. 4-3. Werner, Alfred. Max Weber. New York, 1975: 50, color pl. 62. King, Marian. Adventures in Art: National Gallery of Art, Washington, D.C. New York, 1978: 115, pl. 74. American Paintings: An Illustrated Catalogue. National Gallery of Art, Washington, 1980: 254, repro. Wilmerding, John. American Masterpieces from the National Gallery of Art. National Gallery of Art, Washington, D.C., 1980: no. 56, color repro. Williams, William James. A Heritage of American Paintings from the National Gallery of Art. New York, 1981: detail 212, 214, repro. 216, color repro. 224. Brown, Milton W. One Hundred Masterpieces of American Painting from Public Collections in Washington, D.C. Washington, D.C., 1983: 130-131, color repro. Henderson, Linda Dalrymple. The Fourth Dimension and Non-Euclidian Geometry in Modern Art. Princeton, 1983: 130-131, color pl. Ricciotti, Dominic. “The Revolution in Urban Transport: Max Weber and Italian Futurism.” American Art Journal 16 (1984): 56, fig. 1. Walker, John. National Gallery of Art, Washington. Rev. ed. New York, 1984: 574, no. 878, color repro. Ricciotti, Dominic. "City Railways/Modernist Visions." In Susan Danly and Leo Marx, The Railroad in American Art: Representations of Technological Change. Cambridge, Massachusetts, 1988: 132, color pl. 99. Wilmerding, John. American Masterpieces from the National Gallery of Art. Rev. ed. National Gallery of Art, Washington, D.C., 1988: 172, no. 63, color repro. 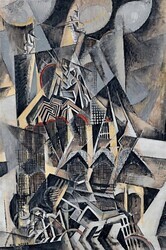 Max Weber: The Cubist Decade, 1910-1920. Exh. cat. High Museum of Art, Atlanta, traveling exhibition, 1991: 62, no. 57. American Paintings: An Illustrated Catalogue. National Gallery of Art, Washington, 1992: 375, repro. Stokstad, Marilyn. Art History. New York, 1995: 1097, fig. 28-109. Stokstad, Marilyn. Art History. 2 vols. Revised ed. New York, 1999: 1097, fig. 28-110. Oja, Carol J. “George Antheil’s Ballet Mecanique and Transatlantic Modernism.” In Townsend Lundington, ed. A Modern Mosaic: Art and Modernism in the United States. Chapel Hill, 2000: color pl. 4. Miller, Angela et al. American Encounters: Art, History, and Cultural Identity. Upper Saddle River, NJ, 2008: 458, 460, color fig. 14.12, color frontispiece. Alfred H. Barr, Max Weber Retrospective Exhibition, 1907–1930 (New York, 1930), 11. The other paintings are New York at Night (The Archer M. Huntington Art Gallery, The University of Texas at Austin), New York Department Store (Detroit Institute of Arts), and Chinese Restaurant (Whitney Museum of American Art, NY). Dominic Ricciotti, “The Revolution in Urban Transport: Max Weber and Italian Futurism,” American Art Journal 16 (1984): 55. Irving Lewis Allen, The City in Slang: New York Life and Popular Speech (New York, 1995), 91. Holger Cahill, Max Weber (New York, 1930), 37. In this same vein, Lloyd Goodrich, Max Weber (New York, 1949), 30, noted: "although in certain works Weber like Delaunay and Kandinsky approached closer to pure abstraction than did the cubists, even his most abstract works were always related to specific themes. Never purely formal exercises in plastic values, they were primarily expressionistic." Lloyd Goodrich, Max Weber (New York, 1949), 28–30. Robert Rosenblum, Cubism and Twentieth-Century Art (New York, 1960), 221–222; quoted in Alfred Werner, Max Weber (New York, 1975), 50. For a discussion of these sources, see John O. Hand, "Futurism in America," Art Journal 41 (Winter 1981): 337–342.